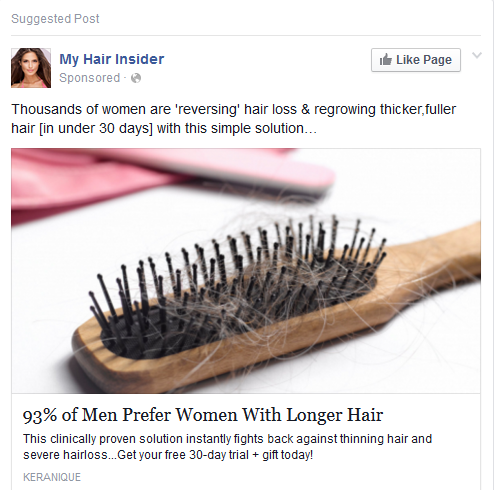 There was a suggested post on my Facebook for some product that will make you grow/regrow long luxurious hair quickly. I was a little confused why I was targeted for such an ad since I cut my hair off this year (probably asked and answered). I haven’t looked up anything to do with long hair or hair products of any type, plus I don’t experience hair loss (the ad does not really target this, it barely mentions hair loss). Normally I ignore ads on FB unless they are writing related but this one grabbed my attention. According to a recent survery 93% of men agreed that a women’s hair is the most important attribute over all others. Again, yes with the spelling. The reader is called girlfriend, which implies it’s written by a woman (for shame) and apparently researchers were stunned by the results. FFS people. It’s offensive that they are saying most men won’t find me attractive unless I use their product and grow my hair long. It’s more offensive that they think I would be swayed by this. Do they think every woman with short hair is going to read their ad and say ‘Guess I better get to growing it out or I’m gross?’ Oh and I better tell my daughter to cut her long hair off since she doesn’t like men. That way she only has to fend off 7% male attention. The ad stated women with longer hair are more confident. GIRLFRIEND, do you know how much confidence it takes to pull off a pixie cut? I don’t care what anyone else thinks I should look like/be/think. Ads don’t manipulate me. Not even Jif commercials work on me (choosy moms…). It’s a dumb way to market a product. It’s like saying “93% of women prefer men who don’t wear skinny jeans.” Wait, maybe that’s just me…Ignore that last part and Justin if you’re reading this, PLEASE don’t buy skinny jeans just because I was being hypocritical! Now I’m not going to lie, I believe it’s probably true that the majority of men like long hair. I hope most women don’t care. My husband likes my hair long or short but even if he wanted it long I wouldn’t grow it out again. I prefer it short so short it stays. I can’t be short hair shamed. Even if it affected my ego I remember what it’s like to have tangles and I’m never going back! How I look shouldn’t be determined by the wishes of anyone but me. Unfortunately since curiosity got the better of me and I clicked the ad, I will be getting more and more ads like it. They will fit right in with all the other unusual things popping up after doing research for stories. I’m writing about a war with ghosts so you can imagine the kinds of stuff I’ve looked up. If nothing else good came of this the ad got me writing when I didn’t feel like it. So thanks dumb sexist ad. Sidenote: If you are wanting longer, thicker, fuller hair and want to try a product like this, go for it. You do you. Remember when you use to be able to state your opinion online (or off) and not offend anyone? Me neither, because there were never any good old days when you could say what you want and there not be consequences. If you’re going to say something offensive then someone will be insulted. Hell, these days, someone can and probably will find pretty much anything you say offensive. I’m not saying you shouldn’t be able to state your opinion, you certainly can and if you want to, go for it. However, you should be prepared for the outcome. One thing I’ve noticed, especially on Facebook is the shock and indignation when someone disagrees with another. If you stand on a sidewalk and shout out how much you hate a particular group you’re going to see a reaction right? Why would it be different online? Logically we all know that not everyone will agree with us one hundred percent of the time. So why then are there so many FB fights with the person instigating it getting upset or confused? How many times have you seen someone do this and say they weren’t trying to start drama? These people are full of it. If you post something polarizing you will get a fight. People who do this want to argue. They want to share their glorious opinion with the world, but especially with those who disagree. If you start a status with: “I know this is going to upset some people but I don’t care,” or pop in an: “If you don’t like it (or agree) you can unfriend me,” then you know what the outcome will be. Doing this is like adding on: “Bless her heart,” to the end of a nasty statement so you can say something whatever you want about another person without sounding mean. Besides, there are easier ways to make sure you’re only surrounded by people who agree with you. You know what you’re doing, don’t pretend otherwise. Do you have the right to argue on your own personal Facebook or others’? Of course you do. Should you? That’s up to you to decide. Does it bother me? Actually no, unless you pretend like you weren’t trying to fight. Taking up the innocent person standard while waving a flag of war invalidates your argument for me. The point is, if you want to be confrontational and challenging, do so, but at least call it what it is. Obviously this is MY opinion and I know a few people who would be offended by it. I’ll apologize now for provoking anyone. No, wait, I knew exactly what I was doing when I wrote it. Bless your heart.